This presentation focuses on a project-in-progress titled Waters of the Past. The project has emerged from residencies in the Faroe Islands, Iceland, New Zealand and Norway in 2016-17. Waters of the Past explores the iconography of the sea and natural environment as a juxtaposition to ancient runic symbols. These symbols represent a culture and language lost as well as a ‘proxy’ for ancestral links to the old country. The use of the expression ‘old country’ is very much embedded in my migrant heritage. I am a 5th generation Australian with Norwegian, German, Irish and English ancestry. According to Ancestry.com, 40 per cent of my DNA is Scandinavian. I see the rune symbols as very powerful to constructing a narrative about place, history and belonging, offering a link between culture, time and environment at an experiential level. *It needs to be stated from the outset that my interest is in the pre-Christian, Pagan roots of these symbols and not the misappropriation of Norse culture and symbols by Neo-Nazis / Alt Right hate groups. I would also like to state clearly that while in Norway I have spent a lot of time with people who connect strongly with Norse culture and heritage, one of whom has written a book about the Viking Code of Conduct, the Hávamál. My Norse friends are egalitarian and anti-racist. Inherent in this cultural expression is a great respect for nature and all sentient life. Waters of the Past is part of a larger project focused on the environmental and cultural aspects of water – Words for Water (2013- ). There have been many iterations of the Words for Water project and many collaborators. Words for Water incorporates a range of media and technologies including video, photography, augmented reality and performance. DNA and environmental data are also used in some of the works. Firstly, I will provide some background to Waters of the Past, the role of the runes and my collaboration with software developer and artist Josiah Jordan. Secondly, I will show a short video from Josiah about our collaboration and DNA Music. Finally, I will show an excerpt from the video presented at Balance unBalance in Plymouth in August 2017. This work was also recently presented as a guided meditation at the Kulturhuset Hovtun. Many symbols have meanings that resonate across cultures, geographies and time. These symbols often have meanings that connect to nature, the seasons and the elements. Ancient symbols are woven into our modern, technological experience. We don’t think twice about the meanings that are embedded in the symbols associated with the technological tools we use every day. 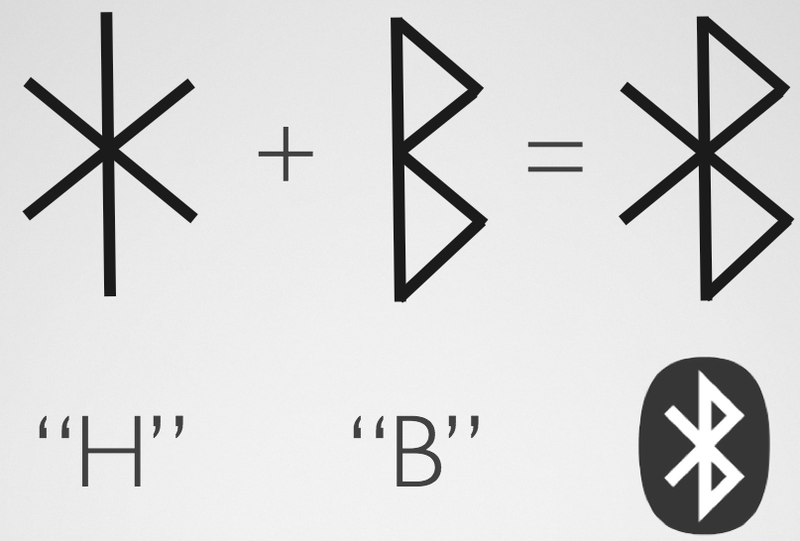 The symbol for Bluetooth is one such example, referring to the Danish King Harald Bluetooth’s name in Runes. He was renowned for bringing together the Danish tribes and being a gifted communicator. 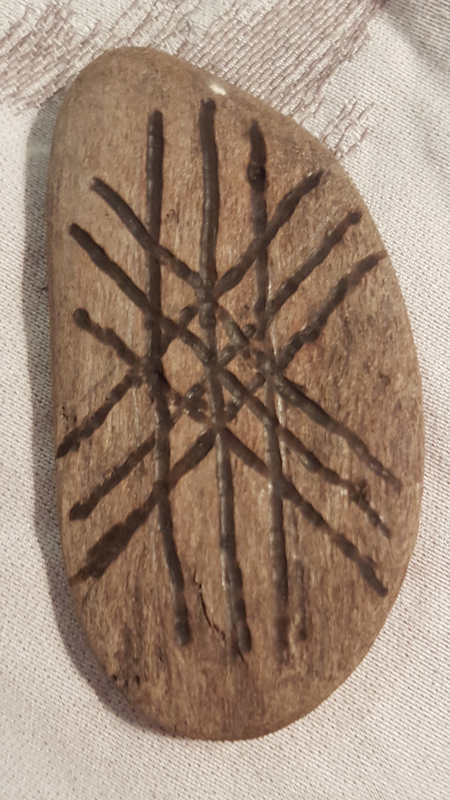 Given the role of collaboration in my projects, I was very interested in finding a rune symbol that could articulate the notion of weaving, of connecting people, thoughts and ideas. I wanted to give form to the intangible knowledge that presents itself when stories and knowledge is exchanged. The collaborative process is one of many perspectives and knowledge coming together to co-create – weaving something tangible from our different offerings. I have used this small piece of etched driftwood as a talking stick at workshops as a way to communicate complexity and diverse speaking positions. Here it is again as part of an outdoor intervention at Crawick Multiverse led by Chroma Space’s Kate Vega in a work titled The Calling in September 2017. We connected with Vanuatu, Australia, Norway and the USA through simultaneous performance – sharing intention. As earlier mentioned the Waters of the Past project has a number of parts. The first iteration Changing Tides used augmented reality, video and photography to create a meditative work that contemplated the ebb and flow of the tides, incorporating the runes in a performative way. The runes are made from stones found on the beach and then the symbols would be carved into them with a shell. Once the set was completed they were ‘offered’ back to the sea as a gesture that reflected the movement of time and the shifting of energies through the power of the ocean. 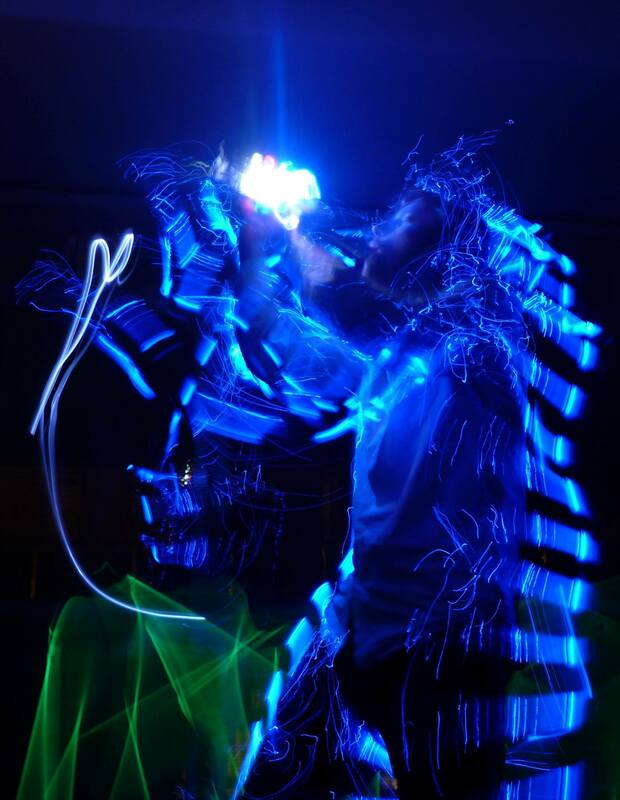 The second stage, Journey of the Ancients || Walking with the Ancients, brings in Josiah’s work creating music with my DNA. Josiah and I started to work together after a residency in New Zealand in February 2017. We identified many synergies between our interests and were both seeking to create AR and VR works that had the potential to be meditative, hopeful and connected to nature. Our residency group had participants from Europe, New Zealand, the USA, Australia and Canada. Within that group a number of Indigenous cultures were represented – Māori (Aotearoa/New Zealand), Chamorro (Guåhan/Gaum) and Inuit (Canadian Territories). The residency was run by Intercreate.org – an interdisciplinary Trust based in New Zealand. This is Josiah speaking about our collaboration. The imagery is from 360 camera footage taken in Norway and will be part of our VR exploration. The audio in the background is the DNA Music. Journey of the Ancients : Josiah talks about collaboration from bytetime on Vimeo. This video was presented at Balance unBalance in Plymouth, August 2017. As discussed earlier, the intention is to create a meditative environment where the audience can experience the piece in many different ways. When it was presented at the Kulturhuset Hovtun as a guided meditation, participants were invited to close their eyes if they preferred to just experience the audio aspect of the work. Our next step is to develop the VR – using game engines to explore the potential of the rune stones to expand a story world and to bring in more interactivity. Our first rune symbol to explore will be the Wyrd. Tracey Benson is an artist, social scientist and researcher based in Canberra. She focuses on issues related to wellbeing, sustainability behaviour change, energy futures and water. She explores a range of media including open data, augmented and virtual reality, often collaborating with cultural owners and scientists. Community and audience engagement are critical concerns and this is echoed in her work at the Department of the Environment and Energy. 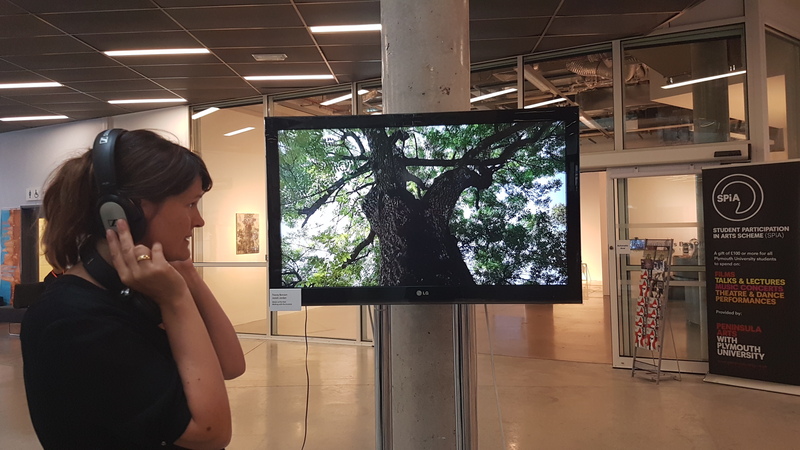 Tracey is also a part-time academic at the Faculty of Art and Design and a Professional Associate of the Institute of Applied Ecology at University of Canberra. Her work has featured in many international and national media festivals since 1996. 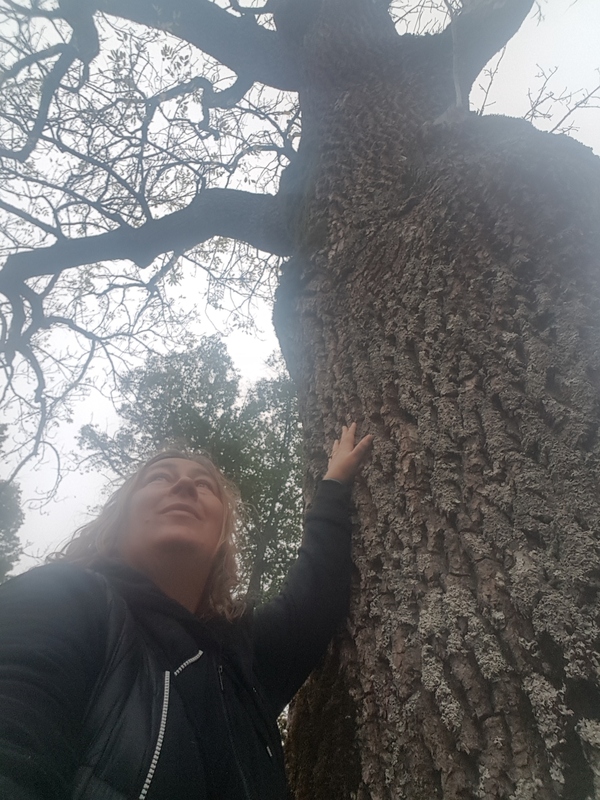 Tracey has a PhD from ANU and is currently undertaking a Masters of Applied Science by Research at the Institute of Applied Ecology. In 2016, a spiral was used as a symbol to connect cultures in a project titled Way of the Turtle: Exchanging Breath. Māori are New Zealand’s First Peoples and Yorta Yorta are one of Australia’s First Nations. Yorta Yorta Country (Nation) is located along three rivers, most significantly Dhungala, the Murray River, Australia’s largest river. This video is documentation of a work developed for Water, Peace, Power (WPP) at Parihaka, New Zealand. 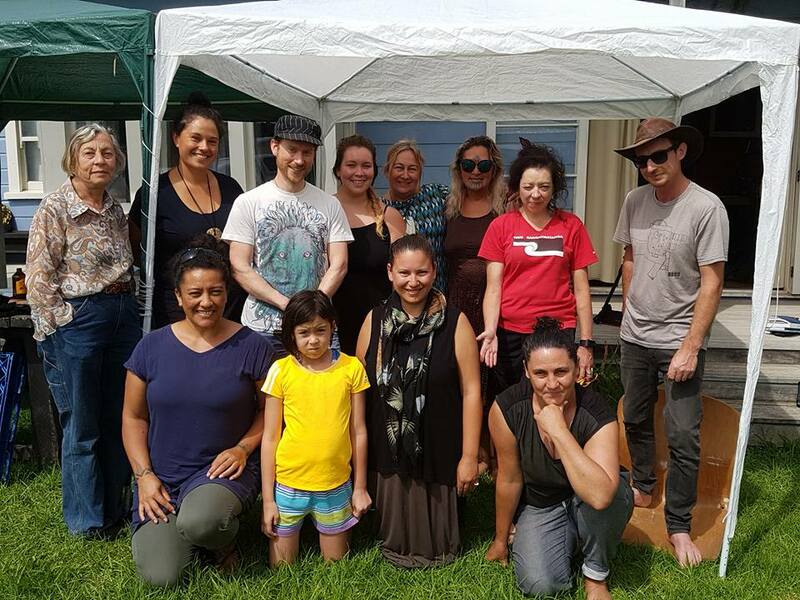 The sound element of the work features vocals of Parihaka descendant Jo Tito and Yorta Yorta Elder Sharon Atkinson combining Māori, Yorta Yorta and English languages and stories. Lee and I collaborated with Nigel Helyer, Martin Drury, Andrew Hornblow and Allan Giddy to create this work. Lee and I presented this work at last year’s Open Fields via video. Bob Vanderbob’s Fecundity project from Balance unBalance 2015 addresses some of these themes to great effect. FECUNDITY trailer from Artificial Mythology on Vimeo. I actually have a different interpretation of those runes but we don’t have time to explore those nuances today. Wow Tracey this is a great blog, you have done a fantastic job of bringing together many of the different aspects of this ongoing project, your ancestral ties ,the runes, the meaning of the Wyrd, the 360 degree imagery, the colaboration with Josiah Jordan, the meditative video and DNA music etc has been weaved together into an extremely informative article.